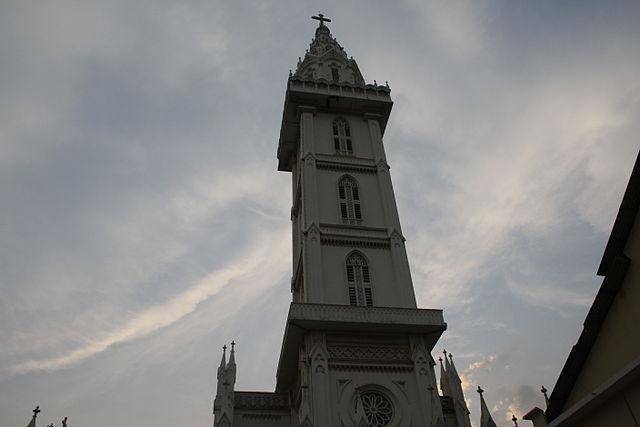 Asia’s tallest church tower, Bible Tower, is located in Thrissur in “Our Lady of Dolours Shrine”. The church was built in 1929. The bible tower stands 260 feet tall and was inaugurated in January 2007. Department of Geology of India declared the tower earth quake proof. A lift helps ferry the tourists upto 160 feet up the tower. At this level of 160 feet the tower has a viewer’s space which can accomodate 250 people. Above 160 feet, tourists have to climb through steps. The top of the tower offers a panoramic view extending upto 18 kms. The wooden door which leads into the church is in scripted with words from the Bible. The wooden statue of Infant Jesus is an exquisite work. The glass paintings of the tower are sure to leave a visitor spellbound. The miracles of Jesus Christ etched in brass are a piece of work worth admiration.